This horizontal dial is engraved on a brass plate with three straight edges and the fourth of irregular, decorative shape, where a suspension hole is pierced. 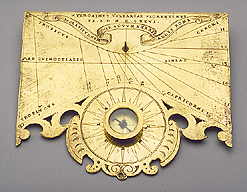 The pin gnomon dial indicates Italian hours from 10 to 23, and the tropics and equator are inscribed 'TROPICVS CANCRI', 'TROPICVS CAPRICORNI', and 'AEQVINOCTIALIS LINEAE'. The symbols of the signs of Cancer, Capricorn, Libra and Aries are engraved on the tropic and equator lines respectively. On the top of the plate is the signature 'HYERONIMVS VVLPARIAE FLORENTINVS ? FA ? A ? D ? M ? D ? LXXVI' and in scrollwork 'T[expunged]ADLATITVDINEM GRADVVM XXXXII ADDVS ROME'. Below the dial is a small compass mounted above the dial surface, marked for magnetic deviation and with cardinal points. It is surrounded on the plate by a wind rose with 32 directions, eight of which are marked with the initials of the wind names in Italian. The instrument was purchased in 1894 and is described in F. A. B. Ward, A Catalogue of European Scientific Instruments in the Department of Medieval and Later Antiquities of the British Museum (London, 1981), p. 22, no.12.